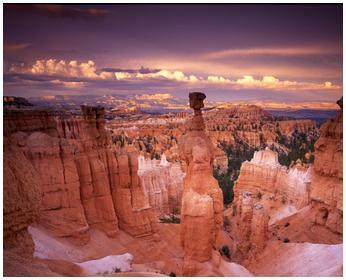 Bryce Canyon is best known for its unusual geologic formations, called "Hoodoos." These hoodoos -- convoluted spires of towering rock -- are often described as eerie, ethereal or whimsical. Bryce Canyon's features are formed by "frost-wedging" and chemical weathering, not by rivers or flowing water. This makes Bryce a very uncommon canyon. The Park's 8,000 - 9,000 foot rim offers the visitor a "Far View" from the eastern edge of the Paunsaugunt Plateau. The high rim to the bottom of the canyon drops over 2000 feet, creating three distinct climatic and habitat zones: spruce/fir forest, Ponderosa Pine forest, and Pinyon Pine/juniper forest. This wide range of ecosystems provides for high biodiversity: Over 100 species of birds, dozens of mammals, and more than a thousand plant species exist in the Park. Bryce Canyon is also known for its night sky. The lack of artificial light surrounding the park makes it an ideal location for stargazing. Western Spirit Cycling offers road and mountain bike tours for any level bike rider. The routes are incredible, the guides are fun and the food is fresh and plentiful. Give us a call! Our guides will help you choose the perfect trip.